According to the list of “who knew?” observances, February 27th is National Cigar Day! 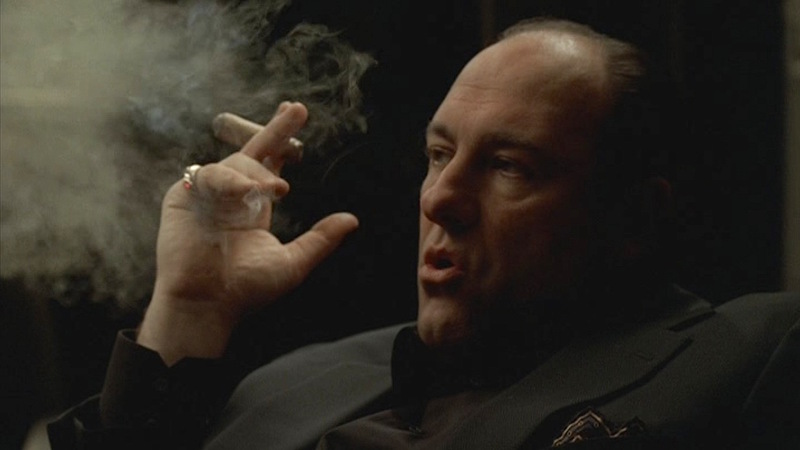 To commemorate this celebration of Winston Churchill, Ulysses Grant, and Mark Twain’s favorite past time, BAMF Style explores one of my favorite cigar smokers of the small screen, Tony Soprano. 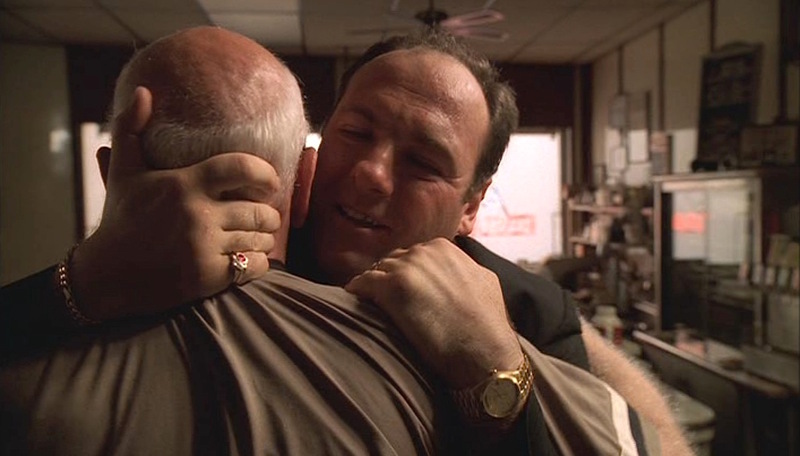 Today’s post goes back to the beginning, when Tony Soprano is balancing the prospect of a mob war with his stubborn Uncle Junior (Dominic Chianese) with the demands of his therapy and family life. If ever there was a time for a man to need a cigar! 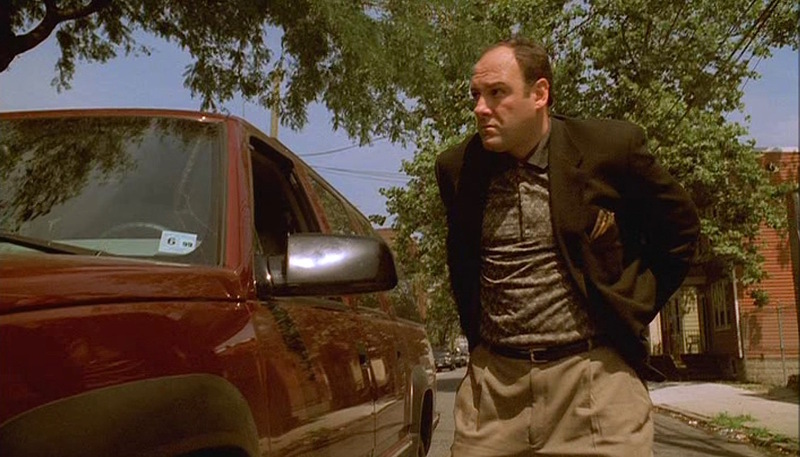 The fourth episode of The Sopranos, “Meadowlands”, features Tony Soprano in an outfit that he would intermittently return to through the series’ run, pairing a black odd jacket with a dressed-down shirt and earth-tone slacks. Interestingly, this combination is almost always worn in tandem with one of Tony’s therapy sessions. Tony’s black wool single-breasted jacket in “Meadowlands” has notch lapels that roll to a two-button front, straight flapped hip pockets, and a welted breast pocket where he wears a gold printed silk pocket square. 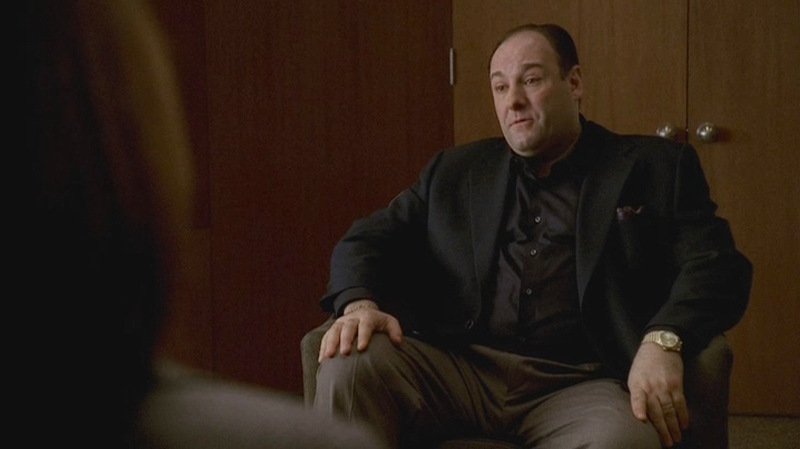 Men of James Gandolfini’s size tend to prefer pleated trousers for their roominess over the hips, and Tony wears a pair of khaki slacks with double reverse pleats. These trousers have narrow belt loops for his black leather belt, side pockets, and turn-ups (cuffs) on the bottoms. …Tony then stashes the pistol in the back of his trouser waistband, hoping that he won’t need it but fearing the worst when working against his excessively proud uncle. 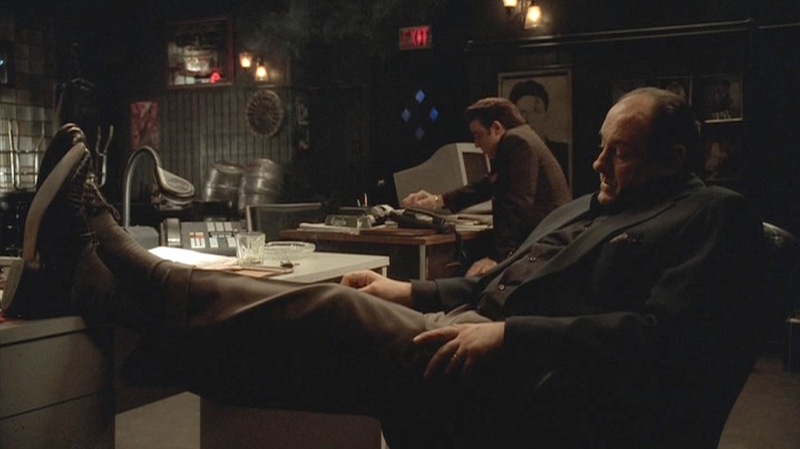 Tony’s shoes are the same black calf leather derbies that he had worn for his previous confrontation with Uncle Junior in the same episode when he wears wearing his gray suit with a black shirt and tie. These shoes have a perforated cap toe and five lace eyelets. He wears them with black cotton lisle socks. 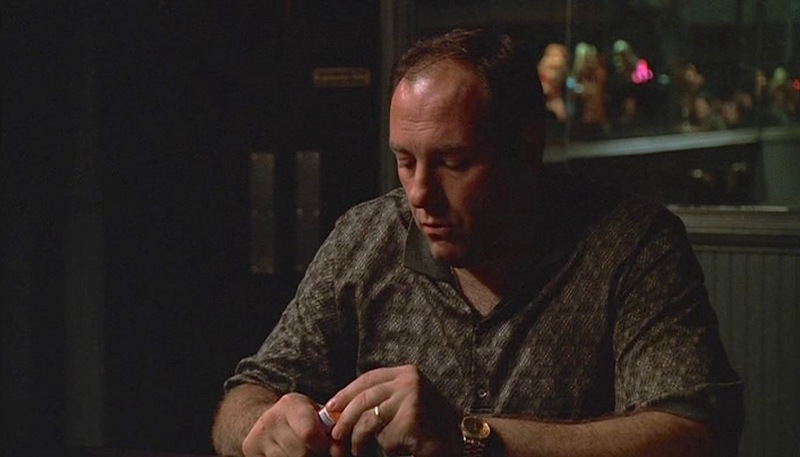 Tony’s patterned silk polo shirt, also briefly worn sans jacket in “Boca” (Episode 1.09), consists of a print of broken gray rectangles and black hash marks on an olive-taupe ground. The shirt’s twill collar, ribbed sleeve ends, and inner placket are all the same solid olive-taupe color. Tony wears the three-button “plain front” placket both buttoned to the neck and with the top button undone. Tony sports both of his usual rings, a gold ring with diamond-and-ruby clusters on his right pinky and a plain gold wedding band on the third finger on his left hand. On his right wrist, Tony wears a gold chain-link bracelet. Tony’s watch, an 18-karat yellow gold Rolex “President” Day-Date 18238 is worn on his left wrist. This classic watch has a 36mm yellow gold case, a champagne-colored dial, and a heavy Oyster three-piece link bracelet which gives the timepiece its “President” moniker. Touted by Rolex as its “most prestigious” model since 1956, when it was famously worn by then-U.S. President Dwight Eisenhower, the Rolex President is a fitting choice for a powerful man in a leadership position like Tony Soprano. Tony uses his aged uncle’s pride as a negotiating tactic, quietly arguing for more control in the middle of a congratulatory embrace. Unseen here but almost certainly present is the gold 18″-long open-link chain necklace with a St. Jerome pendant that Tony always wears. 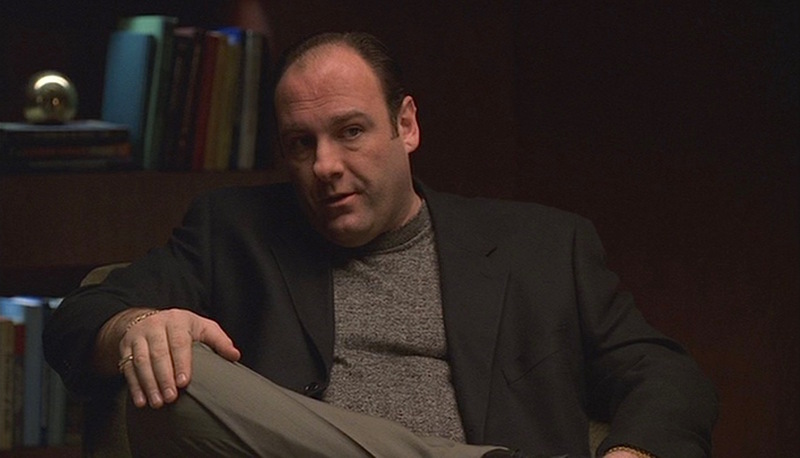 As I mentioned, the black odd jacket and earth-tone slacks would come back from time to time over the course of The Sopranos. Certain elements remained the same: a black single-breasted jacket, an earth-toned shirt always worn sans tie, earth-toned pleated trousers, and black derby shoes. 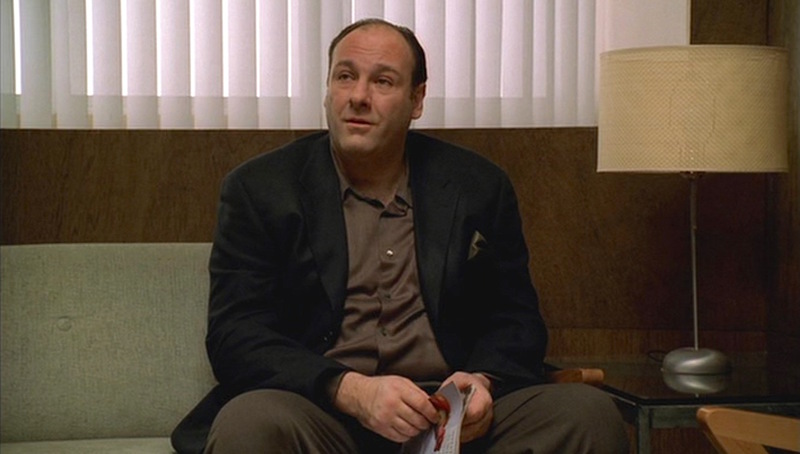 The outfit’s next appearance was the penultimate episode of the second season, “The Knight in White Satin Armor” (Episode 2.12), when Tony shows up in therapy wearing clothing that is likely bigger than his first season garb to accommodate Gandolfini’s increasing size. Tony wears a black three-button jacket and taupe pleated trousers. His black derby shoes have a split-toe unlike the perforated cap-toe of his first season footwear. Tony also wears a melange oatmeal mock-neck shirt, a style that combines the aesthetic of a crew-neck sweatshirt with the lightweight comfort of a T-shirt. It’s slightly dressier than either of those garments, but it’s still less formal than a collared shirt so Tony foregoes a pocket square with this outfit. “The Knight in White Satin Armor” (Episode 2.12): Tony’s most dressed-down version of the black odd jacket and earthy slacks ensemble. Thus, by the time of “Employee of the Month” (Episode 3.04), Tony arrives at his therapy appointment with Dr. Melfi wearing a silky brown shirt with a plain front, breast pocket, and button cuffs. Much of the character’s wardrobe overlapped between seasons two and three, so he seems to be wearing the same larger black three-button jacket as he did in “The Knight in White Satin Armor”, this time with brown double-reverse pleated trousers and an olive silk pocket square. “Employee of the Month” (Episode 3.04): The silky texture of the shirt is all that keeps Tony’s base layer from resembling a UPS uniform. The most sinister incarnation of the black odd jacket and earthy trousers arrives for the outfit’s final observed appearance. 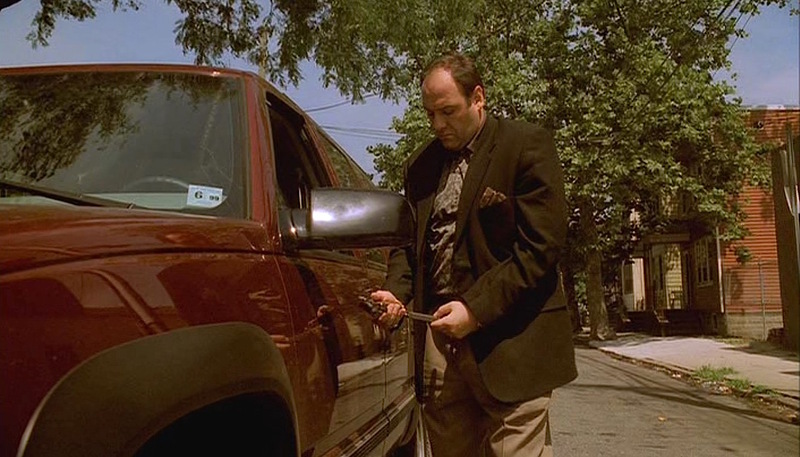 Even for a violent mob-centric show, The Sopranos had taken a decidedly dark turn by the time of “All Due Respect” (Episode 5.13), reflected by Tony’s all-black upper half. He has graduated to an even larger black jacket, this one with a two-button front and three-button cuffs, worn with a silky black shirt with a plain front and mitred two-button cuffs. Tony wears another pair of taupe brown slacks with double reverse pleats and cuffed bottoms. His cotton lisle socks are a close match for the trouser color, continuing the leg-line into his black derby shoes. His finishing touch is a black silk pocket square with a tan-and-taupe pattern, unifying all of the colors in the outfit. James Gandolfini as Tony Soprano in The Sopranos episode “Employee of the Month” (Episode 3.04), following his usual template for wearing a black odd jacket with earth-toned trousers, silk pocket square, and dressed-down shirt. Black suits and jackets are often associated with mobsters. 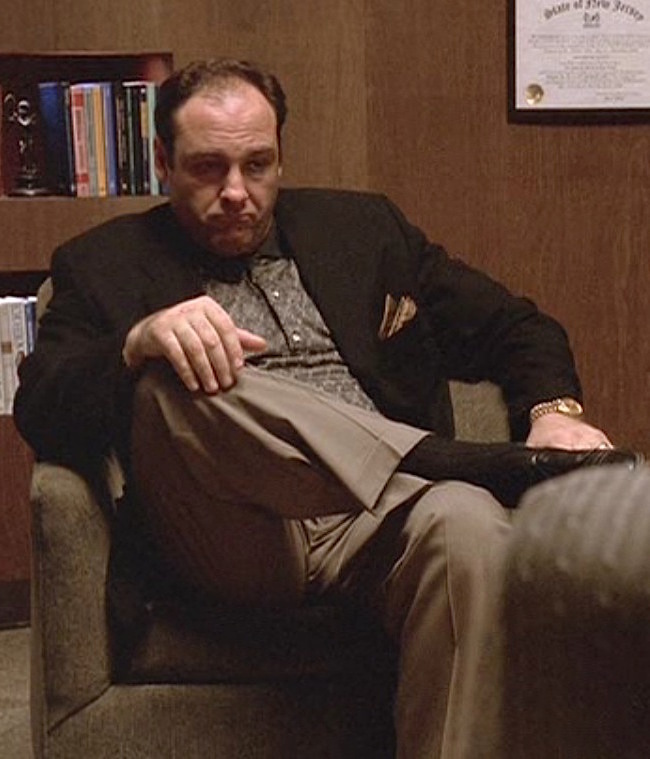 It’s interesting to see the difference that color makes when comparing Tony Soprano’s black odd jacket and slacks with the more traditional navy blazer and khakis… and thus determining what his diversion from this norm says about how he balances his own image with that of a “legitimate businessman”. Having been warned by his Uncle Junior to “come heavy or not at all” to their next meeting, Tony packs heat before entering Junior’s hangout. The pistol that Tony loads and slips into the back of his trouser waistband has been identified by IMFDB and confirmed by The Golden Closet’s records to be a FEG R9, a double-action Hungarian copy of the classic Browning Hi-Power. Tony prepares for the worst. After decades in the design phase, the single-action Browning Hi-Power was introduced by Belgian manufacturer Fabrique Nationale (FN) in 1935 and led the way for the following generation of “Wonder Nines,” a moniker given to semi-automatic pistols chambered in 9x19mm Parabellum with staggered magazines designed to carry nearly double the capacity of their predecessors. As it was introduced in the years leading up to World War II, the Hi-Power design was a hot commodity among both Allies and Axis, with the Germans taking control of the FN factory after they occupied Belgium in 1940. Many countries took a stab at producing their own copies of the Browning Hi-Power, including Canada, India, and Hungary. The Hungarian firm Fegyver- és Gépgyár (FEG) may be better known to the world now for its HVAC units than its firearms, but it produced its own variants of the Browning Hi-Power, the P9M and the PJK-9HP, during the Cold War. During the 1990s, FEG began exporting its products to the United States, including the single-action FP9 and traditional double-action P9R and R9 variants. 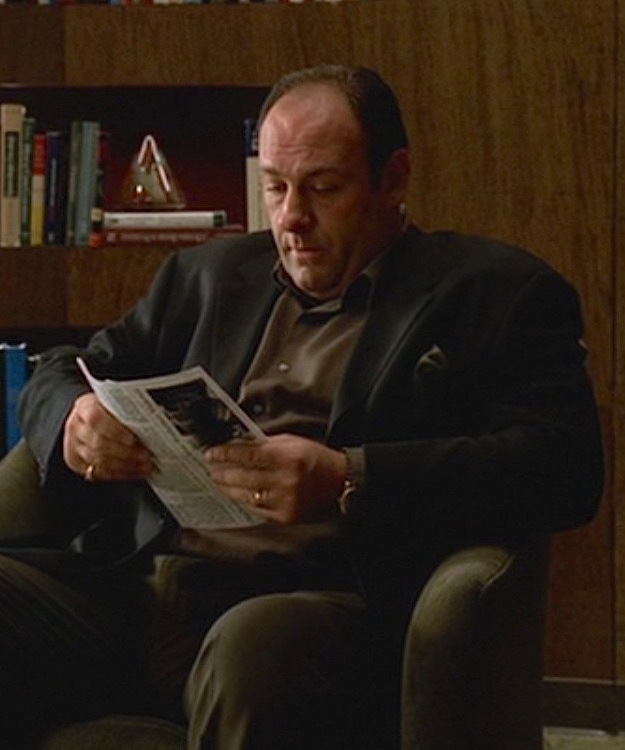 The Sopranos used at least one of the latter, a FEG R9, during the first season. 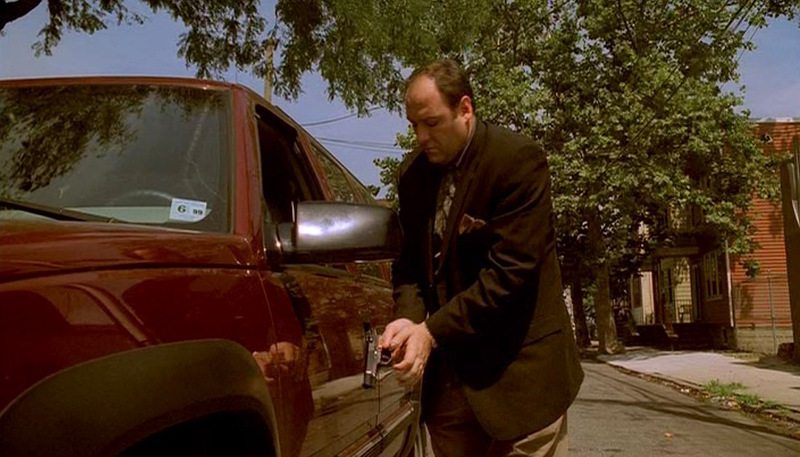 It was first seen in “Meadowlands” (Episode 1.04) when Tony packed one before his meeting with Uncle Junior and again in “I Dream of Jeannie Cusamano” (Episode 1.13) when Paulie is gunning down one of Junior’s guys in the woods. Check out the entire series… and celebrate National Cigar Day accordingly! My uncle, he’s got me in a box where I gotta do something I don’t want to do. Then there’s my mother. I pay four grand a month for this place, and she acts like I’m an Eskimo pushing her out to sea. The jacket looks almost like it is part of a suit where Tony often uses the jacket as a sports coat. He probably hasn’t much use for a solid black suit outside of a funeral. @ryanhall To be fair, I would think that a black funeral suit might just be one of Tony’s most worn items of clothing!